Yehuda Burla (1886-1969), was born in Jerusalem, the descendant of a family of rabbis and scholars originally from Izmir, Turkey, that had settled in Eretz Israel some three centuries earlier. He studied in yeshivot and at the Jerusalem Teachers' Seminary. During World War I he served in the Turkish army as an interpreter. 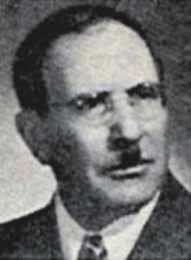 After the war he became director of Hebrew schools in Damascus, where he lived for five years. He later taught in Haifa and Tel Aviv. Burla's stories depict the environment, language, customs and thinking of Middle Eastern Sephardim. Burla served several terms as president of the Hebrew Writers Association and as chairman of the Bio-Bibliographical Foundation, Gnazim. He was awarded the Bialik Prize twice (1939; 1955), The Ussishkin Prize twice (1944; 1960), The Israel Prize (1961) and the Jerusalem Prize (1962).